Two Indian students have been arrested and released on bail for hurtling a dog off a multi-story building in the city of Chennai in southern India. Two medical students, identified as Gautam Sudarshan and Ashish Pal, filmed how they had sadistically thrown a dog from the roof of a multi-story building about two weeks ago. The offenders were suspended by their college, arrested and released on bail Wednesday. They were ultimately fined 10 and 50 Indian Rupees (US $0.15 and US $0.74) and served no jail time. Their canine victim was found alive on Tuesday by animal rights activists with the help of volunteers among residents. The little dog was named "Bhadra," the Hindi word for "blessed." 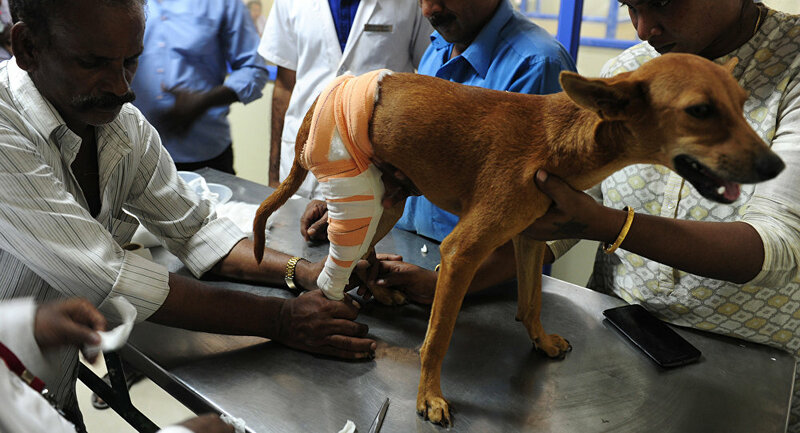 She was injured and unable to walk, but still wagging her tail, according to an animal rights activist Shravan Krishnan. One of her legs was fractured, but vets who treated her said that she is out of danger. "We confirmed she was the same dog because the[one in the] video looked like she was a female dog; there is a small black patch on her tail, her hind legs are injured and she wasn't able to move properly," he posted on his Facebook page. "The Prevention of Cruelty Act is pretty outdated, it is a 1960 law and we want a change in that because they can just get away with a fine of Rs. 50," said Krishnan. The fact that the students have already been released has also caused anger. — Anil Srinivasan (@anilsrinivasan) 6 июля 2016 г. Animal rights activists are petitioning for tougher laws and stricter penalties to punish cruelty to animals. — Varun Sood (@VSood12) 6 июля 2016 г. Two men in Chennai studying to become doctors flung a dog from a balcony to his death. And they expect to heal and save human lives later? — Lynn de Souza (@lynndesouza) 5 июля 2016 г. Why not throw the Chennai dog torturers off the same roof???? Let them know how that feels? — Shobhaa De (@DeShobhaa) 6 июля 2016 г. Took me days to get over the shock and outrage over those boys throwing a dog from the terrace in #Chennai. Morons. Rot, both of you! — Sneha Mahale (@randomcards) 6 июля 2016 г.